Recently refitted Tyker design, built by FR Nautisme and designed by Julien Marin in 2006. These early pioneers of the 'Class 40' offer excellent value for money when maintained in good condition, with the recent works and equipment upgrades this boat certainly fits the bill for low budget entry level racing and is in ready to sail condition. Superbly finished for a 'vintage' category boat, these early prototypes were renowned for their speed and versatility and less optimised for specific conditions (unlike their modern progeny) making them better all-round performers. This boat had some good racing success under the care of a number of top flight French sailors including Patrick Morvan and Yvan Noblet. ‘Impulse’ as she is now known, won the inaugural Les Sable- Madeira- Les Sable in 2007 and in the same year finished 4th in the Transat Jacques Vabre being beaten to third place by her sister ship. She has had much work to improve both her performance, efficiency and general condition over recent years with works including, structural reinforcements to bring the boat in line with more modern and rigorous construction standards, repainted interior and exterior surfaces, new deck hardware and layout optimisation in 2018, new navigation station, keel and pins X ray inspected in 2017, new rudder bearings in 2018, rig overhauled and refitted with survey and most running rigging replaced, electronics refreshed in 2014 with plenty of new hardware, engine completely overhauled from the bottom end up in 2014. This boat needs to be seen and sailed to be appreciated. Lorima carbon two spreader rig. Refinished Awl Grip 2014. Rod rigging removed, measured, inspected 2016. Full rig survey completed. New head stay 2014. Composite Rigging 07 Kevlar/Dyneema cover. Inner head stay Kevlar with Dyneema cover, removable. Windex, tricolor light, steaming light, VHF antenna at masthead. Heol Composites carbon boom with lazy jacks. New Awl Grip 2014. Mast conduit and wiring replaced 2018. Future Fibres topmast and check stays. Facnor FX2500 furler for trinquette. Main. Incidences D4 Twaron laminate. 4 reef points. Fair condition. Main, Incidences D4 Twaron. 3 reef points. Good condition, requires service and battens. Solent. Star Voiles. Twaron laminate. Reefable, hank on. Good condition. Storm jib. Good condition. Requires adaptation to new lock/furler arrangement. A4 masthead/Reefable to fractional A5. All Purpose. Good condition. GNK. Light upwind sail/heavy screecher. Pentex. Good condition. GNK. Light upwind sail. Incidences. Fair condition. Fully repainted 2017 in AwlGrip Light Grey and Medium Grey. New non-skid. All lines run aft to Constrictor clutches, via new centreline tunnel added 2016. Hardware mostly all new 2018. Two Lewmar deck hatches (new 2017). Antal Mainsheet traveller (New 2018). Running rigging, majority new 2018. Nanni 3.100 HE. Fully rebuilt 2014. New water pump, coolant pump, alternator, wiring harness. All new bearings, piston rings, seals. Full rebuild on head, new valves, guides, seats. Rebuilt injectors and injection pump. New control cables, throttle lever. Shaft drive to two blade folding prop flexofold. Shaft seal new 2018. Start battery. Braille lightweight racing (New 2018). Lowrance 4G Broadband radar antenna. 2014. Furuno GP32 independent GPS system. AIS. Digital Yacht, with antenna splitter. Three Ultra Power UA 24 sealed AGM batteries. New 2014. New wiring, ATC fuse holders, etc. Lopolight navigation lights port, starboard, stern. Two x Gyropilot 2 processors. One x NKE Hydraulic drive unit. 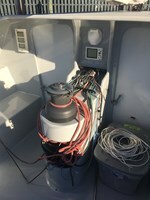 One x Raymarine drive unit (needs repair). Two x TL25 multi display units. Two x Gyro Graphic displays. NKE Universal Radio Receiver with remotes. Fusion MS-BB100 marine stereo with speakers. Bottom faired, five coats of epoxy barrier primer (Interprotect 2000), Petit Black Widow bottom paint (2017). Topsides faired, painted Awl Grip Light Grey (2017). Keel, rudders sprayed five coats epoxy barrier coat, fluorescent green Petit Vivid (2017). Keel grid structure reinforced, new structure added to bring boat up to ISO standards for grounding load. 2014. New aluminium mast compression post. 2014. New navigation station, galley unit. Ballast system comprised of two tanks, manifold, pump, pickup scoops. 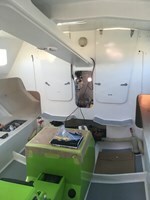 Keel removed, fin, pins, etc. inspected with x-ray. 2017. Liferaft. Plastimo Transocean 4 man. Soft Valise. 3 x Harken winch handles. Inventory to be confirmed and subject to contract.